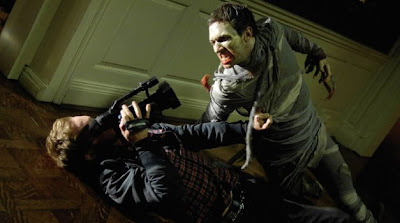 For his fifth zombie film, genre legend George A. Romero chose to re-stage the beginning three days and nights of his initial outbreak, thus making Diary of the Dead forever linked (for better or worse) with his original film, Night of the Living Dead, more than any of the others. Rather than just being a re-tread of that groundbreaking movie however, Romero opts to modernize the situation, giving us a very 21st century essay of the events. This concept is echoed mainly through Dairy’s literal presentation, with the whole film viewed through the home video recordings of one Jason Creed (Joshua Close) which has been spliced together into a film within the film, “The Death of Death”. Jason’s motive is to upload his footage as they try out run the situation to offer, what he believes, the media is failing to do, by not covering the events truthfully and without censorship. Yes the media is firmly the target or Romero’s angst here, though somewhat less veiled than his other films sub-texts’. Diary is a small film in almost every concern, including its ambitions. What is noticeable about Diary though, is the numerous homage’s to earlier films of the director (Dawn of the Dead, The Crazies), in-jokes and even a cameo from the man himself. This all proves that it was a much more labour of love than his previous effort, the decent but studio-driven Land of the Dead. Happy to be returning to his independent roots, it shows with his fans being rewarded with plenty of in-the-know quirks. These will be lost on non-Romero fanatics however and thus it is ultimately more enjoyable if you are one. Not to say that it is alienating, rather that it is made for a certain type of audience and if you are not part of it, you’re less likely to enjoy the film as a whole. On top of that, as a film it has its problems. Of the leads, only Debra (Michelle Morgan) & the Professor (Scott Wentworth) really stand out. The whole idea of the internet being a lone truth telling hero amongst society‘s great lying media is a bit muddled and unconvincing at times. However, it comes from a rushed script that if expanded a bit more, could have proved more feasible. Its surprisingly short length doesn’t help and it is over all very quickly. The slight lack of zombie carnage may disappoint some gore hounds, but there is some great gore moments of course with Romero proving, even though zombie is the ‘new black‘ in Hollywood, he’s still unique when it comes to putting his beloved undead on screen. Overall, it is a worthy (re) telling of the zombie apocalypse, which initially was only planned for a much more subdued, direct-to DVD release. That might have actually benefited the film, as it is strictly for Romero hordes - anyone else might be hard pressed to see what all the fuss is about. Finally, the biggest issue by far is the fact that the director made it in the first place. Part of me does wish that “going back to the well”, as Romero has done with here, is not the best he has left to offer. I’m not sure how many more films he has in him, but it would be nice to see something different than him clinging onto a legacy he can’t really match anymore. There is still fun to be had with Diary, and it is a very well put together effort, it just seems all very unfortunately forgettable. It would be a great film if he hadn’t already made it better 35 years ago.